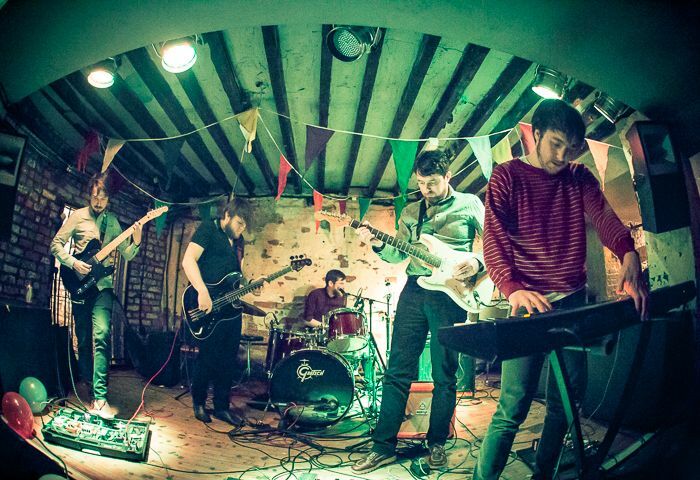 With RongoRongo set to release a new EP, Getintothis’ Paul Higham runs the rule over a fuller yet urgent sound and reports on a forthcoming live date. With a new EP, Automatic Hypnotist, set for release on December 11 and a live date at Constellations on December 19 as part of War Room Records Christmas shindig alongside By The Sea and AGP, December looks set to be a busy month for Liverpool’s RongoRongo. We’ve long been singing the praises of RongoRongo and, with this forthcoming release it seems they have fallen firmly under the radar of the national media. On taking a listen to the latest EP it seems that this is more than justified and we can only foresee an upward trajectory for this most intriguing of bands in the New Year. Building on the promise of earlier work such as Slice of Heart, on cursory first listen it seems that the intense claustrophobia and foreboding atmospherics have been cast aside, replaced with a more polished sheen. This is far from a shameless quest for stardom however and feels very much like a natural progression. There is more pop here for sure, yet lead track Faster is still imbued with a sense of mystery coupled with a rhythmic urgency and a broader palette of sounds, aided no doubt by the group’s recent expansion into a six-piece. This is a strikingly modern take on an alternative 80s sound that marries an undeniable pop sensibility with a darker, more layered edge. Where Faster sweeps with a Brix-era, Fall-like propulsiveness, Driven is positively dreamlike. Bathed in luscious reverb and haunting echoes it hints at a growing maturity and reveals such self-confidence to bring a sense of space. So much space that there is nowhere to hide, but then with a song of such majesty RongoRongo have no such need. EP closer, The Hypnotist is perhaps the most ambitious song here and possesses the biggest stride in search of new horizons. Full of shimmering guitars and more prominent vocals, it is a yearning, forward-looking pop song that somehow remains underpinned by tight rhythms and distinctive minimalism. Too often bands make the leap into the new without ever seeming to fully understand what made them good to begin with. Thankfully with RongoRongo we have no such fears. With such a full month, let’s hope the band have got their Christmas shopping done early.